The work trip officially ended about 3pm, Friday in Zeist and I switched into vacation mode as I boarded the plane to London for the weekend. I checked into the W Hotel in Leicester Square (but equally as close to Piccadilly Circus) and as luck would have it, my friend Koren who lives in Seattle was in town. We met up for dinner at The Punch Bowl which was the perfect entry to a Diamond Jubilee weekend. No, it didn't involved the Queen. 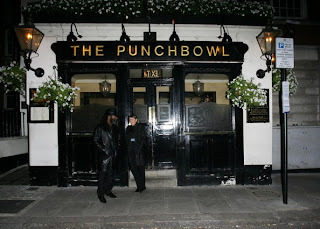 But, it does involve Guy Ritchie (he owns the joint), Winston Churchill (in a portrait over the fireplace) and the second oldest pub in Mayfair. I wasn't sure what I wanted to do next but I had markets on my mind. No less than three people that I trust told me I'd love Borough Market more than Portobello Market, so I decided to check it out. Between Tate and Borough, I passed the Millenium Bridge (cool pedestrian bridge across Thames River) and Shakespeare's Globe Theater. 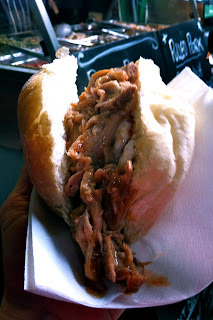 I loved it so much, I have to do another post focusing just on Borough Market, but the food, the drinks, the ingredients, the shopping, the vendors, the people... I wanted to move in. Borough Market with Southwark Cathedral in the background and Monmouth Coffee on the left. I had heard about Roast, but I was curious about other vendors with lines queued up, like Hobbs Meat Roast, which featured pulled pork sandwiches with slaw. I balanced that with a fresh squeezed watermelon juice, but there were so many things I wanted to taste, I had to settle for photographs and get the heck out of there. I walked through the courtyard of Southwark Cathedral where those in the know relax with their market picnics. From there I crossed London Bridge and hopped the tube to see how Portobello Market compared. It was kind of like Dupont Circle Farmers Market vs. Eastern Market. One's good for food and one's good for gifts and home goods. I'm a foodie girl, so Borough Market's my choice any day. After all of that walking around in drizzling London, I was ready to head back to the hotel and blow dry my shoes some more. This is something I would repeat often over the weekend. I had a lot of dinner targets, but I was still full from snacking at Borough Market so I opted for last minute theater tickets. 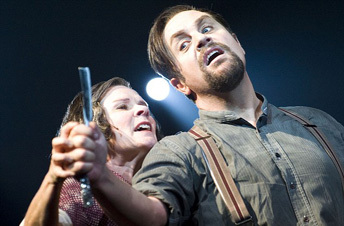 I mean, when in London, you have to see Sweeney Todd, right? Less than an hour before the show, I popped by the Adelphi Theater and snagged second row, center tickets, a glass of champagne and a pistachio macaron from Paul Bakery across the street. After the engrossingly gory show, the cast came out for their usual encore and applause but stayed and sang "God Save the Queen," my first hint of the patriotic fervor to come for the Queen's Diamond Jubilee celebration. The Australian couple next to met told a nearby Scottish gal that they used to do that after every show in the United Kingdom. It was a neat throwback to days of old and one that made me excited about the next day's River Pageant down the Thames River. E will be so happy to see you were close to Monmouth Coffee! Haven't been to London in years but loved following your Tweets! The Tate and a show in the same day! Well done.